So I have the day off and I'm catching up on blogging, reading and writing them. I've been meaning to give you all an update on Dash and Stache, the last two of my foster kittens to be adopted this summer. As you remember, my heart was torn, I loved those little guys. When they weren't adopted, I wasn't disappointed. However, when they weren't adopted, I was a little afraid as they got bigger and started to lose the kitten cuteness, that they wouldn't be adopted. I was baffled that no one was adopting them as they were so friendly at events, their fur was so soft and shiney and they were cute as could be. How could all those people reject my babies? As the weeks progressed and I got more and more attached, I did what several of my friends parents did for them...kind of. I have several friends whose parents prayed for their spouse from the time they were babies...and they all were married to good, Godly men. I decided to bring in the "big guns" and pray to God for a family for Dash and Stache. I was very specific. I wanted them to have a young couple that would spoil them rotten, treat them like children and just love them up. Prayer works. Two weeks after starting my prayer and after an evening of tearful pleading with God the night before....my prayer for Dash and Stache was answered. The cool thing, their new mom friended me on Facebook. She gave me permission to share a couple of the pictures they posted of the boys at the beginning of Football season. Here, the boys are sporting Ohio State sweatshirts. Yes...how cool is that, their new parents are Ohio State fans! Stache is at the top, Dash is at the bottom. 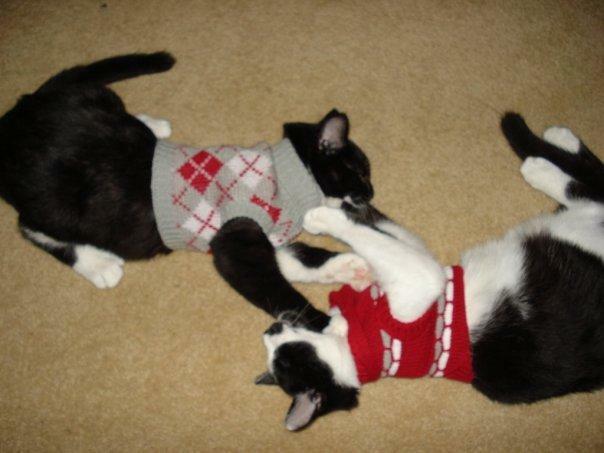 Stache: "Hey, help me out of this sweater!" Dash: "I can't, I think I'm paralyzed!" This is Dash and his mom. He was very upset over a score made by the other team. Dash: "UNBELIEVABLE! How hard can it be to tackle someone?! 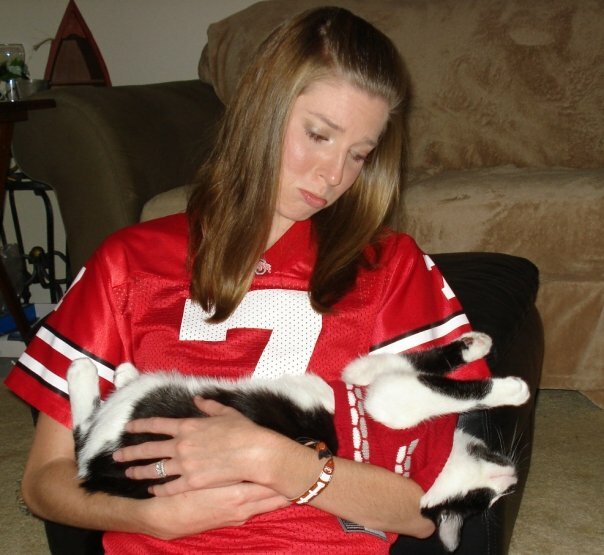 If the Buckeye's lose I think my short life will END!" 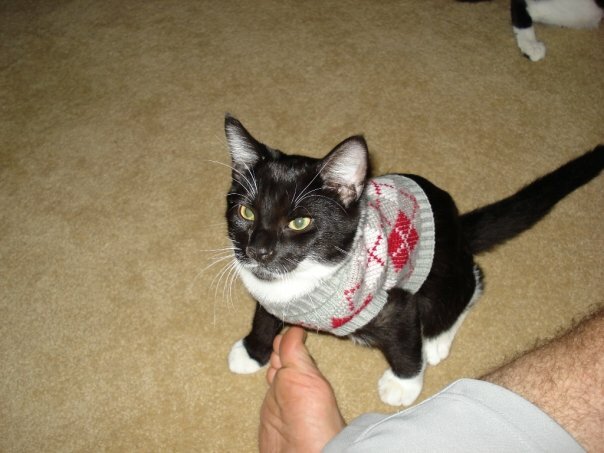 Below, Stache realizes that he can move...and still eat while wearing his sweater. Stache: "Hey Dad, hand over the grub and no one gets hurt!" I laughed and laughed at the pictures. I know they are being loved and spoiled rotten. They are adorable little guys. I also got a kick out of reading all their friends' comments on the pictures. Their parents' kept their names, Dash and Stache, and people thought those names were cool. Their mom updated me on their first vet visit. It went well and they are healthy. Stache is going to be the big guy and was a whole pound heavier than Dash. They enjoy chasing each other up and down the stairs and entertaining their parents. ....and they lived happily ever after!